Children need safe, nurturing and permanent families. 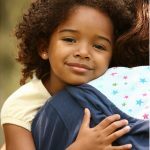 The Schuyler Center promotes policies that advance or maintain effective, high-quality systems that serve at-risk families, prevent entry into the child welfare system, and improve child well-being for children who are in care. We advocate for accountability of public systems, including better data regarding child outcomes and expenditures of funds. Facilitate data collection and reporting on expenditures and results. EXECUTIVE SUMMARY Hopeful Futures for New York’s Children. Every three years the federal Health and Human Services Administration for Children and Families’ Children’s Bureau conducts an assessment of states’ performance on child welfare outcomes. The review, called the Child and Family Services Review (CFSR), assesses states’ performance in areas related to child welfare. 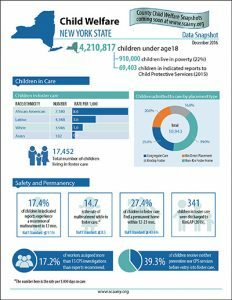 Here, we focus on the Review’s evaluation of New York State’s performance on the following measures: safety of children involved in the child welfare system; speed with which children are placed in a permanent home and remain there; and the number of times children are moved while in care. Each of these measures is compared to a national standard. According to its 2015 review, New York ranks near the bottom nationally on safety and permanency measures, indicating that children in New York are more likely to experience a recurrence of maltreatment than children in other states, and are less likely to be placed quickly in permanent homes. New York scores well nationally on one measure: placement stability. This indicates that children in its foster care system are moved less frequently while in care than children in other states. County-level data for New York State is available here. Find current (Round Three) CFSR data for all states here. For more information about the Review process and how stakeholders can participate in the process, please read our publication Child & Family Services Review: An Opportunity to Work Together to Improve the Safety and Well-Being of Children Involved in New York’s Child Welfare System, available here. Please note: this federal review excludes youth ages 18 and older from its measurements, as many states do not extend foster care beyond age 18. **Wave 1 and Wave 2 data unavailable for this measure. i Measures the rate of victimization for all children in foster care in a 12-month period. The number here is the rate per 1,000 days in care. ii The percentage of children who experience a second report of maltreatment within one year of an initial indicated report of maltreatment. iii The percentage of children who enter foster care and are placed into a permanent home – by returning to their family, being adopted, or through guardianship with a relative – within 12 months. iv The percentage of children who are placed into a permanent home within 12 months of the start of the period, after having already been in foster care for 12 to 23 months. v The percentage of children who are placed into a permanent home within 12 months of the start of the period, after having already been in foster care for 24 months or more. vi The percentage of children enter foster care within a 12 month period and who return to foster care within 12 months of being discharged from care to a permanent home (returning to their family, being adopted or through guardianship with a relative). vii Measures the rate of moves among foster care placements for all children in foster care in a 12-month period. The number here is the rate per 1,000 days in care. Testimony submitted to the Joint Fiscal Committees on the SFY 2016-17 Executive Budget Human Services Budget Hearing. February 9, 2016. Submitted by Kate Breslin, President and CEO, Schuyler Center for Analysis and Advocacy. The Schuyler Center joins 60 organizations in an open letter to NY’s Governor and Legislature: Raise the Age Now. June 15, 2015.